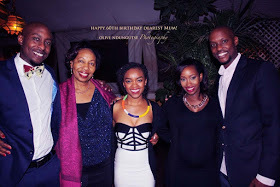 Janet Mbugua Ndichu, the leading female news anchor in Kenya is the talk of town. This gorgeous damsel is actually full of love. She is devoted to her mom and family at large. Her enchanting and thrilling wedding went down a few months ago and she is now preparing to be join the mothers club. 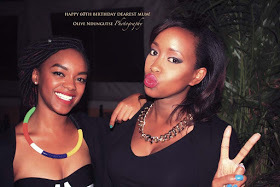 The talented and fine-looking anchor decided to surprise her exquisite mother with an alluring and glamorous birthday party which was held at the Junction Mall (Junkie). ‘’Ladies and Gentlemen, the birthday girl is in the building,’ announced my sister at the table. It was a beautiful evening; a gentle breeze, subtle lighting at the table, candles and dimly lit lamp shades that enhanced people’s smiles and laughter. The group was an intimate one; friends, relatives and plus ones. The girl my sister was referring to was my mother. 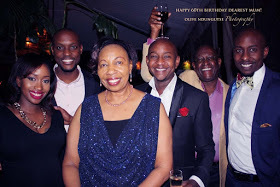 We had gathered to surprise her for a her sixtieth birthday, a major milestone, and my father, the evening’s wingman, had just sent me a text message saying they were climbing up the restaurant stairs, heading our way. The gathering of people, called at such short notice but having turned up all the same, moved me deeply. I smiled and began to feel giddy…you’d have thought it was my own birthday! My mother was genuinely taken aback when the crowd shouted ‘SURPRISE!’ as she walked in. It’s not easy to surprise her, but she literally put her hand over her mouth and began calling out everyone she was most surprised to see, by name. Her childhood friends, her cousin, her nieces and her sister-in-law. It was a beautiful sight…heartwarming, really. My folks have had an intense year and it was great to see them laugh out loud and relax for the night. As the festivities kicked into high gear, people toasting and conversations flowing, the noise around me drowned out and I found myself trying to imagine myself at sixty. I watched my parents, who I’ve grown very close to. Their wisdom, love and generosity is unsurpassed. In my eyes, they’ve always managed to make ‘the balance’ work. Granted it hasn’t been easy, but they’ve lived long enough to know what works and what doesn’t for them. Will it be the same for me? Will I be surrounded by all this love? Will my children throw me a surprise party and call all the people closest to me to join in the celebrations? Will I have gotten to a point where I’m sure of myself, not living life with any inhibitions?